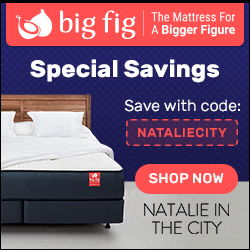 Use the code Nataliecity at checkout for $199 off! Use the code: Natalie10 for 10% off! Use the code: nataliexcraig for 15% off! Use the code NatalieMPT10 for 10% off! Use the code: nataliexcraigxsoncy for $15 off! When you schedule your appointment, mention "Natalie Craig," and get $50 off! NOTE: I may make a small commission off of some of these links and codes, but not all.